Professor Arronax and Ned Land meet Captain Nemo, who reveals that the so-called sea monster they've been told about is actually his submarine The Nautilus. Undersea adventures in a submarine by a dreaming fisherman who encounters mystical underwater creatures at odds with him. A parody on Jules Verne's novel. A test trailer for a re-envisioned 20,000 Leagues Under The Sea, set in the height of WWII, when the naval warfare theatre relied upon superior submarine technology. Union prisoners use a balloon to escape a Southern prison camp near the end of the Civil War and end up marooned on a mysterious volcanic island with very unusual inhabitants. A look at how Jules Verne's classic character Captain Nemo created his underwater vessel, the Nautilus. Captain Nemo: I've always dreamed of finding a woman with a first-rate mind. Someone who can understand me. 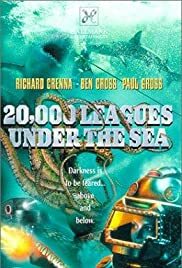 The Jules Verne classic 20,000 Leagues Under the Sea has been adapted many times, too many times arguably and this is a demonstration of that. Starring Ben Cross, Richard Crenna and Paul "Due South" Gross it's another fairly loyal but slightly compacted version of the original novel and the first one with even remotely "Modern" special effects. Telling the timeless tale of a group taken prisoner by Captain Nemo after being stranded at sea, they bear witness to the marvels of his submarine and the wonders of the ocean. I'm not entirely sure why but I find myself struggling to really get engaged into this version, maybe I'm burnt out on the same old story, maybe the distinctly average writing and cinematography left me less than impressed or maybe it's just not that good. There are better versions out there, that's all I can really say. This is Hallmark channel original, and that should tell you everything you need to know.